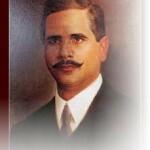 1877: Born at Sialkot (present-day Pakistan) on Friday, November 9, 1877. Kashmiri origin. 1893–1895: High School and Intermediate – Scotch Mission College, Sialkot. 1897: B.A. (Arabic and Philosophy) – Government College, Lahore. Awarded Jamaluddin Gold Medal for securing highest marks in Arabic, and another Gold Medal in English. 1899: M.A. (Philosophy) – Government College, Lahore. Secured first rank in Punjab state and awarded Gold Medal. Reader in Arabic, Oriental College, Lahore. 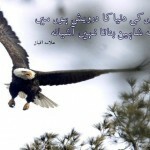 1900: Read his poem “Nala-e-Yateem” (Wails of an Orphan) at the annual function of Anjuman-e-Himayat-e-Islam at Lahore. 1901: Poem “Himala” published in Makhzan. Assistant Commissioner’s Examination (didn’t qualify for medical reasons). 1903: Assistant Professor, Government College, Lahore. Published his first book, Ilm Al-Iqtisad (Study of Economics), Lahore. 1905: Traveled to England for higher studies. 1907: Ph.D., Munich University, Germany (Thesis: The Development of Metaphysics in Persia). 1907–1908: Professor of Arabic, University of London. Started law practice on October 22, 1908. Part-time Professor of Philosophy and English Literature. 1911: Wrote and read famous poem “Shikwa” (Complaint) at Lahore. Professor of Philosophy, Government College, Lahore. 1912: Wrote the epoch-making “Jawab-e-Shikwa” (Reply to Complaint). 1913: Wrote History of India for middle school students, Lahore. 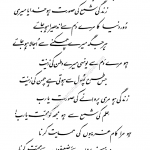 1915: Published a long Persian poem “Asrar-e-Khudi” (“Secrets of Self”). Resigned from professorship to spread the message of Islam. 1918: In counterpart to Asrar-e-Khudi, published Rumuz-e-Bekhudi (Mysteries of Selflessness) in Persian. 1920: English translation of Asrar-e-Khudi by R.A. Nicholson, entitled Secrets of Self. Visited Kashmir and presented his famous poem “Saqi Nama” at Srinagar. East) in Persian. It was written in response to Goethe’s West-Ostlicher Divan. Caravan”) in Urdu in March 1924. 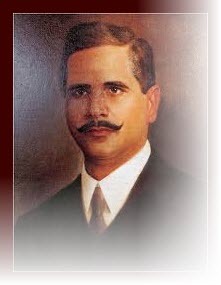 1926: Elected to Punjab Legislative Council, Lahore (1926–1929). 1927: Published Zabur-i-Ajam in Persian. latest scientific and philosophical developments of the 1920s in the light of Islamic teachings. by Oxford University Press. Participated in Mo’tamar-A’lam-e-Islami (World Muslim Conference) in Palestine. Participated in the Second Round Table Conference, London, September 7–December 31, 1931.
remark on the Islamic concept of time. Published Javid Nama in Persian. It was a reply to Dante’s Divine Comedy. Participated in the Third Round Table Conference, London, November 17–December 24, 1932. 1933: Iqbal met Mussolini in Rome after Mussolini expressed his interest to meet him. Visited Cordoba, Spain and wrote the poems “Dua” (“Supplication”) and “Masjid-e-Qurtuba” (“The Mosque of Cordoba”). Served as Advisor to the Government of Afghanistan on higher education (October 1933). Awarded Honorary D. Litt degree by Punjab University on December 4, 1933. 1934: “Musafir” (“Traveller”) in Persian. 1935: Published Bal-e-Jibril in Urdu. 1937: Ulema from Al-Azhar University visited Iqbal at Lahore. 1938: Jawahar Lal Nehru visited Iqbal at Lahore in January 1938. 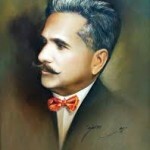 Iqbal died at Lahore on April 21, 1938. Excellent briefing of Iqbal’s major roles in his life.